Captain America may not be the first patriotic superhero—that title belongs to the Shield— but he is by far the most enduring and most widely recognized of those wrapped in the red, white, and blue. Probably more than any other character of the last sixty years, the good Captain has been rendered by artists and writers to reflect the mood of the nation. In March 1941, Captain America’s creators, Joe Simon and Jack Kirby, fashioned his origin after the simplicity of a prewar America: Having been rejected by the army, effete beanpole Steve Rogers volunteers to be a guinea pig for the government’s top-secret super soldier serum. One injection from the brilliant Professor Reinstein and the pale army reject is transformed into the steel-jawed, muscle-rippling Captain America, complete with red-white-and-blue costume, winged mask, chain mail shirt, and stars-and-stripes shield. His mission is clear: “We shall call you Captain America, Son! Because like you—America shall gain the strength and will to safeguard our shores!” Reinstein gets shot and his Nazi assassins soon taste the swift, hard knuckles of the nation’s newest hero. In due course, Rogers joins the army, acquires a kid sidekick—plucky regimental mascot Bucky Barnes—and embarks on a career of enthusiastic Nazi-bashing. Simon and Kirby clearly established Captain America’s identity from the very first issue they created for Marvel (then Timely) Comics, audaciously showing Cap landing a righteous haymaker on the Führer’s chin—on the cover itself! Here was a hero who could protect the free world almost a year before the United States would even enter World War II; a war which the Jewish Simon and Kirby, more than most, likely suspected was inevitable. And if Cap was our hero, then Rogers represented every American soldier who would soon fight for his country. The early stories were simple, straightforward tales peopled with bizarre villains such as the Hunchback of Hollywood, the Black Toad, Ivan the Terrible, and assorted fifth columnists. Chief among the bad guys was the Red Skull, a seemingly invincible Nazi whose face literally was a crimson skull, and who would return again and again. As straightforward as all that derring-do was, it was also gripping, exciting, and fast-moving, and with Kirby’s dramatic art the comic was one of the most widely read titles of the Golden Age era of comics (1938–1954). From Captain America’s beginning, audience identification and participation were central to his success. The first issue announced the creation of “The Sentinels of Liberty” Fan Club, which eager young fans could join for a modest dime, entitling them to a membership card and metal badge. The club proved so popular that the government pleaded with Marvel to wind it down; the badges were eating up too much precious metal, which could be better used in the imminent war. More significantly, in Bucky readers had a role model they could identify with: a boy much like themselves who bravely fought beside their idol with only his two sharp fists to defend himself. It wasn’t long before he was given his own strip as leader of the Young Allies kid gang, who would be featured in more than forty stories in titles such as Kid Komics and Marvel Mystery, as well as in their own eponymous comic book. By the time of Pearl Harbor, Captain America had become Marvel’s top-selling title (at almost one million copies a month), and over the course of the war Cap and Bucky fought the Axis Powers on both fronts. After ten wonderful issues, the comic’s creators were enticed away to rival company DC Comics, but their replacements—novice writer/editor Stan Lee and various artists including Syd Shores—handled things well in their absence. In 1943 the character received the honor of his own Republic Pictures serial, The Adventures of Captain America—confirmation (if any were needed) of his potent iconic status. Then, at the height of Cap’s popularity, the war ended, which was disastrous for this super-patriotic character. After military discharge, Cap and Bucky settled into life as teacher and pupil at a New York slum school, and took the good fight to homegrown mobsters, miscreants, and monsters. But while the country had embraced superheroes in wartime, peace brought an upsurge in crime, funny animal, Western, and romance comics— everything, in fact, except superheroes. In an effort to broaden their dwindling readership, Marvel stuck a conveniently wounded Bucky into the hospital and replaced him with Cap’s longtime squeeze, Betty (or Betsy, depending on the writer’s memory) Ross, a.k.a. Golden Girl. Perhaps unsurprisingly, the gun-toting, high-heeled, evening-gown-wearing Golden Girl failed to resonate with the stalwart Sentinels of Liberty club members, and in 1950 the comic was canceled. Barely four years later, a very different Cap returned. Stan Lee sensed that the country, rocked by the Korean War, was in need of heroes again, and so he reintroduced Captain America, Human Torch, and Sub-Mariner in the dubiously titled Young Men #24. Steve and Bucky were still at school (and still fighting the Red Skull) but the comic’s subtitle said it all: This was “Captain America, Commie Smasher”—a hero for the McCarthy era. Over the course of sixteen stories, the intrepid pair beat the stuffing out of Reds from Eastern Europe to Egypt and from China to Vietnam. But the public simply did not warm to them as they once had. Lee’s instincts were right but he was just a little too early; a mere two years later, DC’s revival of the Flash sparked off the great superhero revival of comics’ Silver Age (1956–1969). By late 1963, Marvel’s own Silver Age heroes were beginning to find a large and enthusiastic audience, and with both the Torch and Sub-Mariner successfully given new life (in a revised version as a member of Lee & Kirby’s Fantastic Four and as a guest-star in the same team’s book, respectively), surely the time was ripe for the good Captain once more. Lee was cautious at first, starring Cap in a Human Torch story and having him turn out to be an impostor, and then reintroducing him properly in Avengers #4 (1964). It seems that, following a pitched battle in the dying days of World War II with the hooded Baron Zemo, in which the pair tried to defuse a deadly drone aircraft, Bucky bit the dust and Cap ended up floating in the ocean in ice-induced suspended animation. (Why Cap and Bucky had seemed to still be alive in the 1950s would be explained a bit later on.) The Rip Van Winkle of comics immediately joined the Avengers, gained an ersatz Bucky in Rick Jones (with his own would-be young allies, a group of intrepid wireless hams called the Teen Brigade), fought copious colorful villains, and started brooding about the past. Within a year of his revival, he had graduated to his own strip in Tales of Suspense, a title he shared with Iron Man, and was well on his way to becoming an icon all over again. However, despite all manner of merchandise, and deliriously exciting art from the returning Jack Kirby, the character would never be as popular as Marvel’s powerhouse headliners Spider-Man, the Fantastic Four, or the Hulk. As an admission that the strip was at its most potent in World War II, this revival almost immediately resorted to “untold tales” of the war, and when that did not quite work Lee brought back the Red Skull and various ex-Nazis. Even though it never again hit the commercial heights of the past, the strip was nevertheless a cornerstone of the “Marvel universe,” and with Lee and Kirby at the peak of their powers, the late 1960s stories were a compelling read. In 1968 Cap graduated to his own solo comic and, despite Kirby defecting to DC (once again), the character has been published continuously ever since. Very much a man out of time, and something of an elder statesman among superheroes, the 1960s Cap was essentially an establishment figure who became the de facto leader of the Avengers, a part-time agent of S.H.I.E.L.D. (Marvel’s James Bond-ian take on the FBI), and a father figure to Rick Jones. Indeed, for a short period in the early 1970s, Rick actually donned Bucky’s costume, and although that did not quite work out, it was clear that Cap worked best with a partner. That troubled decade saw the rise of women’s lib, black power, and introspection, and the strip reflected America’s sense of change and uncertainty. Cap’s girlfriend Sharon Carter preferred life as a jump-suited agent of S.H.I.E.L.D. to the “domestic bliss” of a married life tied to the kitchen and kids. In 1971, Captain America gained a new partner in black social worker Sam Wilson, a.k.a. the Falcon, and for a short time Cap became an NYPD cop on the beat in Harlem’s ghettos. Perhaps most tellingly, one storyline had the Captain doing that most 1970s of things, getting on his motorcycle and heading out into the country in search of the “real” America. By the mid-1970s, Stan Lee had left the comic, and young scripter Steve Englehart took Cap into deeper, darker waters. The 1950s Captain America and Bucky were revived (literally!) and revealed to have been government doppelgängers who had themselves been put into suspended animation after their overzealous red-baiting got completely out of hand. In a lengthy tale that cleverly echoed Watergate, the “Campaign to Rejoin America’s Principles” was revealed to be a cover for the evil “Secret Empire” and the government’s insidious corruption horrified our hero. Sickened at what he saw as the betrayal of his country, Cap quit in disgust, briefly becoming a character called Nomad (as in “The Man Without a Country”) before his innate patriotism got the better of him. 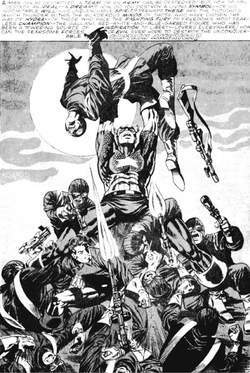 Of course, 1976 was the year of the Bicentennial, and Cap had to have his own take on the celebrations, fighting an underground band of neo-royalists (courtesy of Jack Kirby on his third tour of duty at Marvel). The 1980s came to be dominated by the writing of Mark Gruenwald, who stayed on the strip for an astonishing ten years and adopted a more lighthearted approach as a counterpoint to the previous decade’s upheavals. The strip had always featured a number of recurring villains, including the outrageously camp French martial arts expert Batroc the Leaper, the large-headed Modok, insidious crime cartels A.I.M. and H.Y.D.R.A., and of course the ever-present Red Skull. Under Gruenwald, the villains expanded exponentially but the comic, perhaps, lost some of its individuality in the process. One exception to this was a witty response to recession-era cutbacks, in which the government stripped Steve Rogers of his costume, claiming that they were no longer getting their money’s worth. His replacement, the Super-Patriot (later known as USAgent), soon discovered that like the similarly ill-conceived new Coca Cola, replacing a living legend is far from easy. Inevitably, the original Cap (“Classic Cap,” anyone?) returned, but the departing Gruenwald handed his successors the most poisoned of chalices by killing the character off; it seems that the super serum that had kept him going all those years had finally run out. But there are always more comics to be printed, more movies to be made, and more merchandise to sell. It is an accepted fact, of course, that no one stays dead in comics for very long. One blood transfusion—from the Red Skull, no less—and Cap was back as good as new. So, too, was Sharon Carter, and in fact the 1990s and 2000s saw an endless series of new directions, relaunches, returns to basics, and yet more relaunches. Longtime readers have now learned to expect several inviolable certainties: that Cap will regularly pine for the dear, departed Bucky; that no matter how many painful deaths he may suffer, the Red Skull will always come back for more; that you are never more than a few issues away from a World War II flashback; and that a new direction is always around the corner. 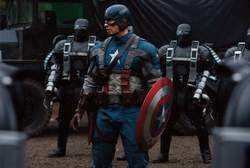 These have included the revelation (in the 2003 series Truth: Red, White & Black, written by Robert Morales and drawn by Kyle Baker), that the super soldier serum was originally tested on black GIs, one of whom briefly adventured before Steve Rogers; hints that Cap was frozen on purpose by a government that feared he would oppose the bombing of Hiroshima; yet another death (in Captain America vol. 3 #50), his resurrection from which remains unexplained; and a new 2004 Captain America and the Falcon comic, by acclaimed writer Christopher Priest. In recent years, another critically praised author, Ed Brubaker, has written Captain America storylines, including the return of Bucky and the seeming death and resurrection of the original Captain America. In 2005 it was revealed that Bucky had survived the explosion at the war’s end, and had been found by the Soviets, who had brainwashed him into becoming an assassin called the Winter Soldier. Between missions the Soviets kept the Winter Soldier in suspended animation, and thus Bucky, though now an adult, was still in his early twenties. Upon recovering his memories of his true identity, Bucky again became Captain America’s ally. Brubaker also wrote the controversial storyline in which the Red Skull engineered what appeared to be the public assassination of Captain America, in 2007. Since Steve Rogers was believed to be dead, Bucky assumed the costumed identity of Captain America. Eventually it was revealed that the original Captain America was not dead, but had been displaced in time and space. The original Captain America finally returned to the present and bested the Red Skull. Steve Rogers decided to allow Bucky to carry on in the role of Captain America. However, Bucky was seemingly killed in the course of Marvel’s 2011 Fear Itself series. Amidst his popularity in the comics, the patriotic hero has appeared in movie serials, direct-to-video productions, and animated adventures. He appeared in a flashback (with X-Men hero Wolverine) for the fifth and final season of Fox’s popular X-Men series, in 1996-1997, then alongside other World War II heroes in a three-part adventure for Spider-Man’s fourth season, in 1997-1998. Although Fox commissioned and developed a Captain America animated pilot in 1998, plans did not proceed. Captain America also appeared in several episodes of Fox Kids’ The Avengers, in the 1999-2000 season. He also appears in two current animated series: The Super Hero Squad Show, voiced by Tom Kenny, and The Avengers: Earth’s Mightiest Heroes. Marvel Studios produced the live action movie Captain America: The First Avenger, which was released in June 2011. The film is directed by Joe Johnston, who previously directed the 1991 film adaptation of The Rocketeer. Set during World War II, the movie stars Chris Evans, who previously played the Human Torch in the Fantastic Four movies, as Captain America, and Hugo Weaving as the Red Skull. Evans returned as Captain America in the 2012 film The Avengers. Avengers: Infinity War' will boast an enormous cast, including Mark Ruffalo as Hulk, Tom Hiddleston as Loki, Chris Evans as Captain America, Scarlett Johansson as Black Widow, Elizabeth Olsen as Scarlet Witch, Chris Hemsworth as Thor, Benedict Cumberbatch as Doctor Strange and many more. A photography account, Atlanta Filming, reported spotting Brie Larson and Chris Evans, who plays Captain America, on the Atlanta set. NYT Syndicate Surprising absolutely no one, Captain America returned to heroism after 15 months as the leader of Hydra, a Nazi-like organisation. Tony Stark, aka Iron Man (Robert Downey Jr), reluctantly submits but Steve Rogers, aka Captain America (Chris Evans), refuses to sign, fearful of the consequences of the Avengers relinquishing their independence. Meanwhile in America, Dr Abraham Erskine (Stanley Tucci) spearheads a programme to create the ultimate soldier, making asthmatic weakling Steve Rogers (Chris Evans) into the muscle-bound Captain America. Meanwhile in America, Dr Erskine (Stanley Tucci) spearheads programme to create the ultimate soldier, making asthmatic weakling Steve Rogers (Chris Evans) into muscle-bound Captain America. Captain America is a hero who represents a bygone era. Scarlett Johansson, Sebastian Stan, Anthony Mackie, Don Cheadle, Jeremy Renner, Chadwick Boseman, Paul Bettany, Elizabeth Olsen, Paul Rudd, Martin Freeman and Daniel BrE-hl appear in Captain America, directed by Anthony Russo and Joe Russo. This time it's Chris Evans and Robert Downey Jr facing off as Captain America and Iron Man. Captain America saga, introduces new characters, has an old favourite (yes, Spider-Man) and sees things get truly tense as Iron Man faces up to Captain America. will be returning to the big screen as Captain America and Iron Man, who will be facing off in the upcoming superhero sequel. Capt. Bob Lewis Billfish Challenge, Inc.